Crossfaith are a Japanese heavy metal band from Osaka who formed back in 2006 and consist of vocalist Kenta Koie, guitarist Kazuki Takemura, bassist Hiroki Ikegawa, drummer Tatsuya Amano and keyboardist Terufumi Tamano and over the past ten years or so they have become well known for their hectic live shows which feature a mad flurry of strobe lightening and also their impressive music which mixes the best of metal, hard-core and electronic music together to make an all-out hard hitting sound that you won’t forget in an hurry. It was back in 2014 when Crossfaith started to make a name for themselves in the UK when they were invited by Kerrang to play on their yearly tour alongside headliners Limp Bizkit and support band Nekrogoblikon and they went down an absolute storm, I remember being at the Brixton Academy show and having never heard of the band prior to the show and I walked away so impressed and immediately checked out their back catalogue as I am sure many others did. Since the Kerrang Tour in 2014 Crossfaith went on to release their fourth studio album ‘Xeno’ which gained rave reviews across the world and featured guest performances from Benji Webbe from Skindred and Caleb Shomo from Beartooth and since then Crossfiath have played all over the world with the UK becoming their second home with so many sold out headline tours, huge support slots and apperances at major festivals like Reading and Leeds, Download, Slam Dunk and many others. ‘Xeno’ was released in 2015 and since then Crossfiath have released a number of long play singles and ep’s and they have hinted that their fifth studio album will be with us some time in 2018 but in the meantime the band are releasing a three track ep titled ‘Wipeout’ for release on the 26th January, an EP about the future something frontman Kenta Koie feels strongly about with Japan hosting the Olympic games in 2020 and also the fact that’s the year the legendary Akira film is set, and these new songs showcase where Crossfaith are going musically and describe their music as images of the future. The EP title track ‘Wipeout’ opens things up and is an impressive listen for its near 4minute duration, the song is crammed with chunky riffs, manic electronic work, infectious vocals and lyrics about flying in the future. ‘Inside The Flames’ is a lot heavier than the opening track and is a straight up mosh pit anthem and you can tell that Crossfaith has created this song for the live circuit as the opening vocals have frontman Kenta Koie shouting out “Let’s go” which is bound to get circle pits flowing at their live shows, as the song progresses it maintains the heaviness yet gets melodic during the infectious chorus. The EP comes to a close with ‘Vermillion Gold’ a truly fast paced, technical heavy song which just like the previous song is going to go down an absolute storm on the live circuit and maybe even more than ‘Inside The Flames’ due to the fast riffs, beats and vocals which conquer the song. 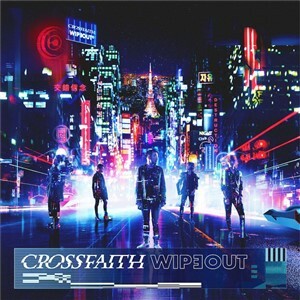 If ‘Wipeout’ is anything to go by then the forthcoming fifth studio album from Crossfaith is going to be well worth the wait as ‘Wipeout’ shows a good progression from the band and is a solid release in the way that three solid tracks are featured clocking in at a total of 11 minutes, it perfectly wets your appetite yet leaves you wanting more as the songs are so good and I really hope news on album number 5 comes sooner rather than later.